The Weston Family Tallgrass Prairie Interpretive Centre is 160 acres (65 hectares) nestled within the heart of the Manitoba Tall Grass Prairie Preserve, just 80 kilometres southeast of Winnipeg. It provides a unique opportunity to experience one of the rarest ecosystems in North America: the tall grass prairie. The area is home to more than 1,000 species of birds, mammals, insects, grasses and wildflowers. Learn about the tall grass prairie ecosystem — its history, the species that live here and how NCC is helping protect it. Browse through our exhibits or take part in a guided tour. Explore the tall grass prairie on the Prairie Orchid Trail. Ask an interpreter to join you or enjoy the trail yourself. Discover what's blooming in the tall grass prairie. Ask an interpreter for cool prairie facts. The centre is available year-round by appointment for school and youth trips, tours and meeting space. The interpretive centre is located in southeast Manitoba, approximately 80 kilometres south from Winnipeg, on Highway 59. For more information on the interpretive centre and its programming, please call 204-425-8118 or toll-free 1-888-731-6007. The Weston Family Tallgrass Interpretive Centre was developed with support from The W. Garfield Weston Foundation, the CP Loewen Family Foundation, private supporters C. Jean Britton and Ransom Slack and the Conserve Native Plants Society. 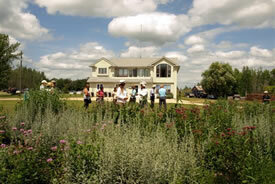 NCC's Manitoba office celebrated the grand opening of The Weston Family Tallgrass Interpretive Centre on July 15, 2013.